Some luxurious homes are so completely realised that entering them is like falling into a whole other world. 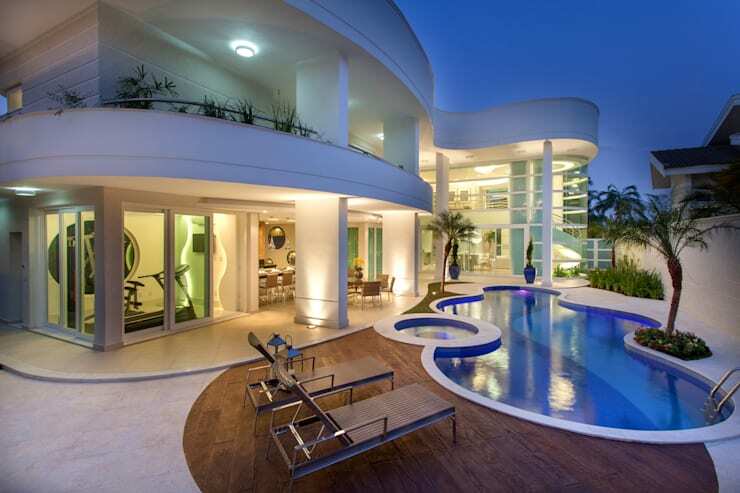 This purely glamorous Brazilian home by Architect Aquilles Nicolas Kilaris is one such home. Curvy spiral staircase, oversized palms, chandeliers galore and of course a dedicated home cinema are just some of the features of this Brazilian home. The ambience evokes images of Hollywood style homes of yesteryear complete with all the unbridled glitz, luxury and all the decadence you might expect. But this is no box-like design with a bit of glitz. The essential structure is unique in that it is formed around a series of curves. To continue the theme, the bespoke furniture has been carefully designed to mimic the flow of the home. Each room is strikingly different and yet cohesive in relation to the other elements. Come with us on a photo tour to explore this decadent home for yourself. Forgive us if we use a few more photos than usual. Enjoy! The white facade of the home is actually relatively subdued when compared to the interior. Nevertheless, it's a striking facade. 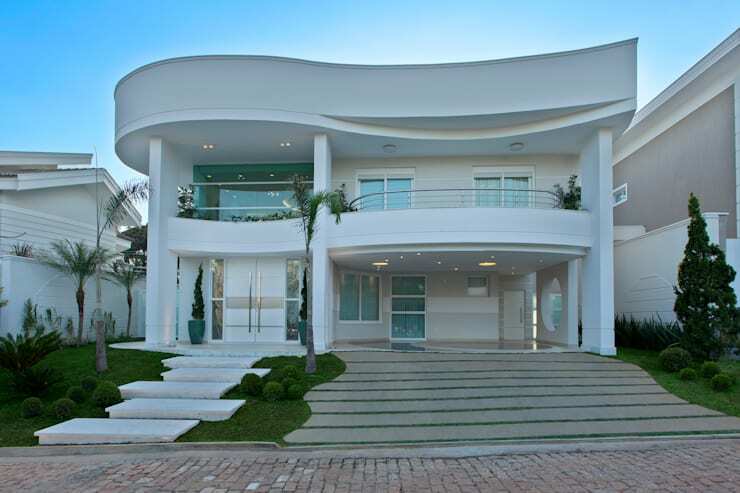 The curvy white facade and gently undulating landscaping exude an effortless beachside glamour. For all the glass though, it's a relatively private exterior. Just inside the entrance we come to one of the main living areas. The double height ceiling adds impressive height made even more impressive by the full sized palm trees and oversized wall art. A shimmering white chandelier drops from the high ceiling down towards the mirror glass coffee table and silvery carpet. Moving through the same main living area, we come to the dining zone. The organic curves of the ceiling and flowing spiral staircase lead the eye around the room in continuous flow. The end result is an atmosphere of abundance. But this sense of abundance does not come at the cost of intimacy. The dining zone is quite distinctively created and made welcoming by the use of two low, large chandeliers. This little indoor rock garden with oversized palms is one of the less glitzy features in the house. But we think it shows just how much thought has been put into cramming as much beauty as possible into this one home. This little white pebbled area leads of course to the bathroom. It adds a tiny bit of spa-like glamour. The curvy theme continues here in the bathroom. Here we have our first example of the custom made furniture that has been so carefully designed to suit the main structure. 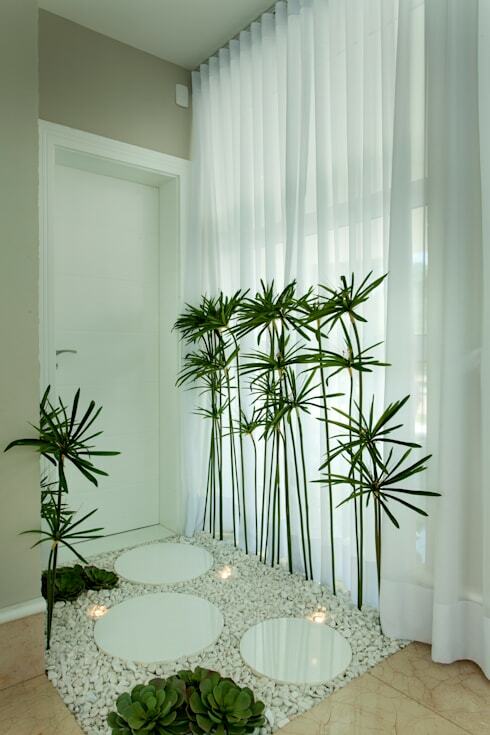 It's an otherwise simple bathroom, but the use of rich wood and the indoor garden here add that tropical feel. 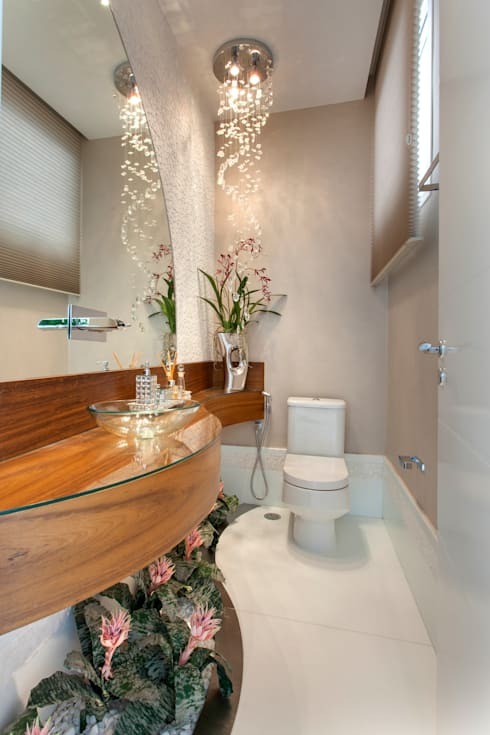 Of course, we should note the chandelier, what bathroom would be complete without one! 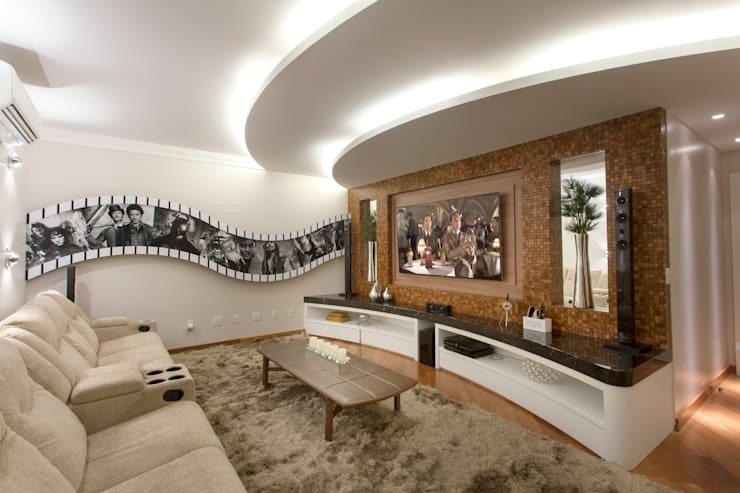 A home with movie style glamour is obviously one with its own home cinema. To amp up the old-style Hollywood glamour, curvy black and white feature art runs along one wall. Here we also have a good example of the scalloped ceiling feature that will be explored more later on. 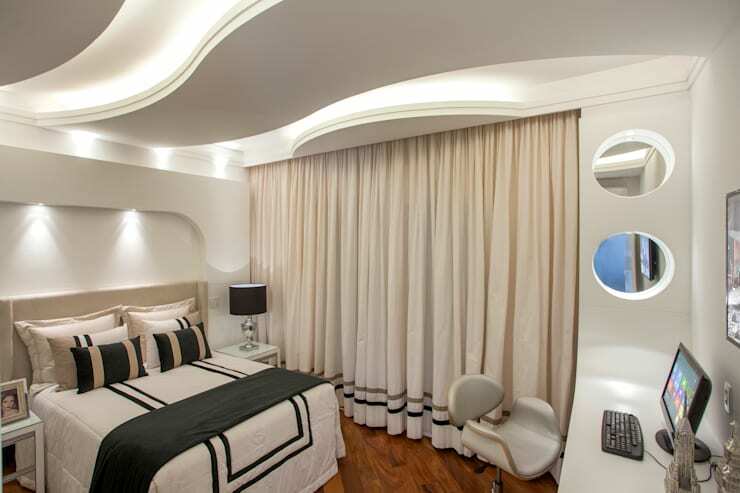 Every bedroom needs some subdued lighting and a little cocoon like comfort doesn't hurt either. Compared to the rest of the home, the bedrooms are relatively small with lots of white curtains and comfortable lighting. This is a home after all and not just a showpiece. Here of course we have the scalloped ceiling feature as noted previously. The recessed areas have been fitted with presumably dimmable lights. This allows for a diffuse and gently subtle overall illumination. 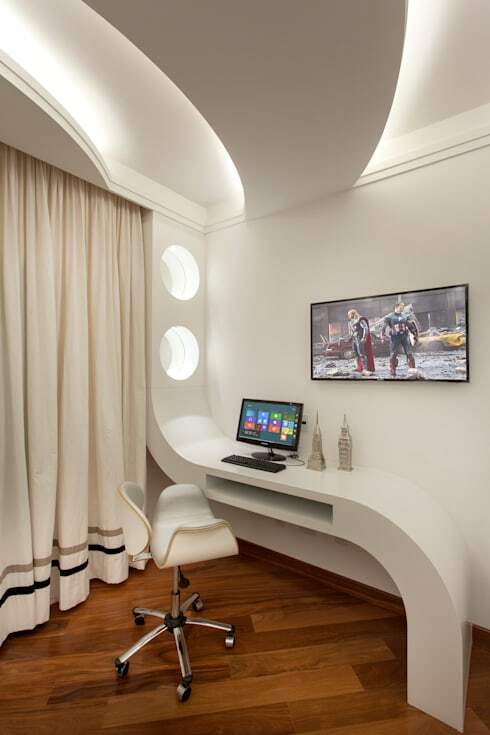 The custom made desk in the bedroom is composed of one single white curvy panel that extends one foot to the floor and the other to the ceiling. What else can we say but wow! Now we may not all look that glamorous while working out, but there's no reason your surroundings can't look pretty snazzy. 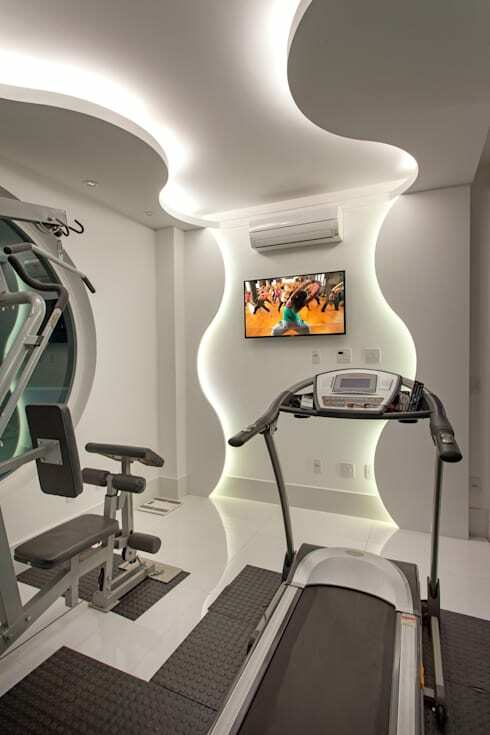 This glitzy but modestly sized home gym has a television, unique, undulating wall and ceiling lighting and of course the obligatory treadmill. In this evening shot, we have a good sense of the overall structure of the main residence and outdoor entertaining areas. We also have a great view of the pool. What Hollywood home is complete without a decadent pool! 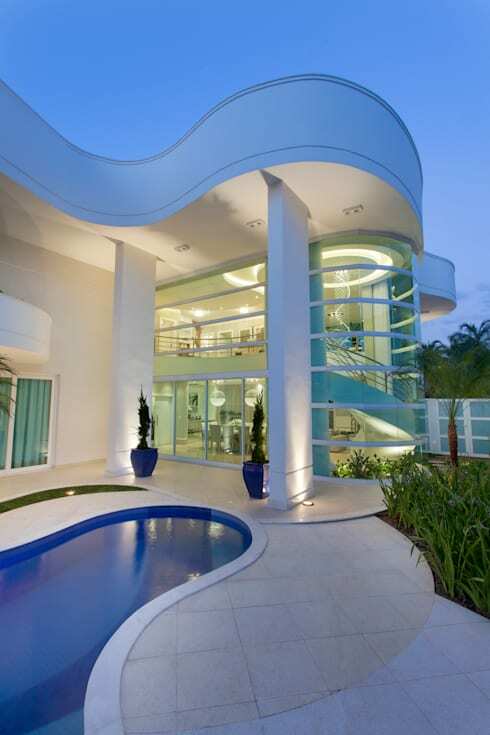 The white curves and small circular spa perfectly meld into the main structure of the house. Even the wooden decking is curved! For our final photo, we can have a closer look at the main structure from the exterior. Here we can see how the spiral staircase to the right has been perfectly integrating into the main curve of the home. We hope you enjoyed the tour. If you are interested in glamorous homes, you'll love this Ideabook Low Key Luxury by the Sea. 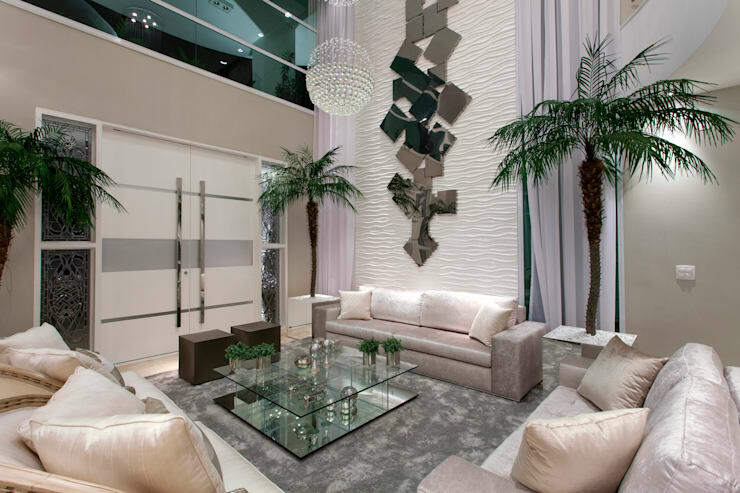 What do you think of this decadent Brazilian home? We would love to hear in the comments below.